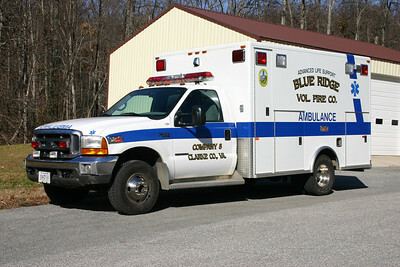 Blue Ridge Volunteer Fire and Rescue - Clarke County Station 8. 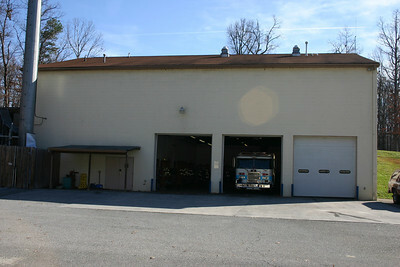 Apparatus bays at Blue Ridge. 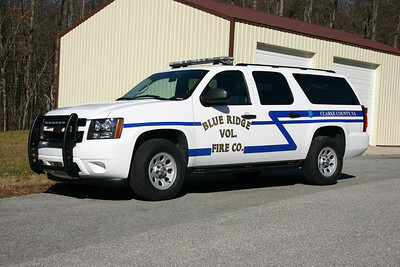 Blue Ridge Volunteer Fire Company in Clarke County, Virginia. Wagon 8 is this tall 2016 Spartan Metro Star 4x4 with a 2017 Smeal body. It is equipped with a 1500/750/30 CAF's foam system. S.O. 4609. 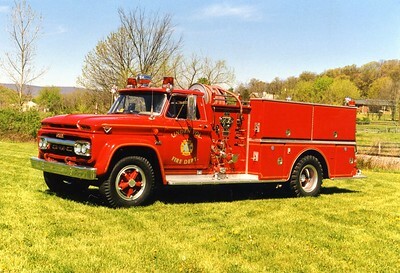 It replaced old Wagon 8, a 1990 Pierce Dash D-800 4x4 which was sold to Boles Fire District in Labadie, Missouri. 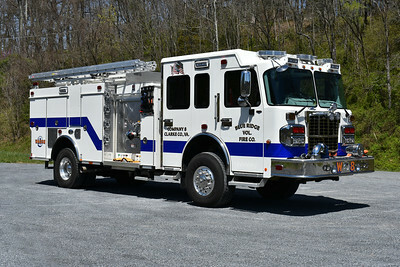 Wagon 8's officer side with overhead ladder rack. 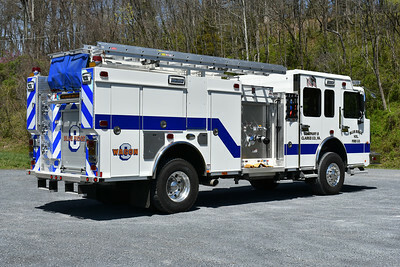 Another view of Wagon 8 from Blue Ridge, a 2016 Spartan Metro Star 4x4/2017 Smeal. 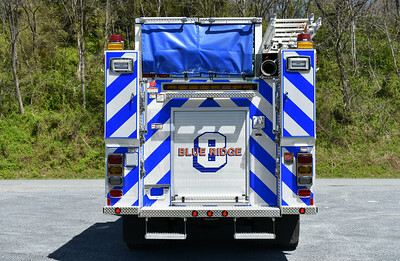 The back end of Wagon 8 from Blue Ridge, as photographed in April of 2016. 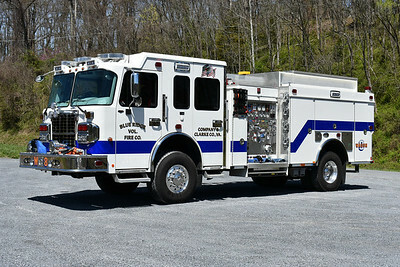 Rescue Engine 8 from Blue Ridge is a 2005 Pierce Dash, 1500/750, sn-17183. Tanker 8 for Blue Ridge was delivered in June of 2017 and is a 2016 Kenworth T800/2017 US Tanker. It is equipped with a 750/3000 and has US Tanker serial number 160000. 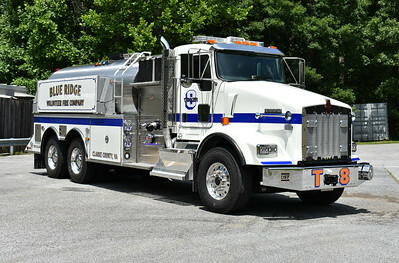 It replaced the department's 1996 International 2674/S&S 2500 gallon tanker. The officer's side of Tanker 8, a 2016 Kenworth T800/2017 US Tanker 750/3000. 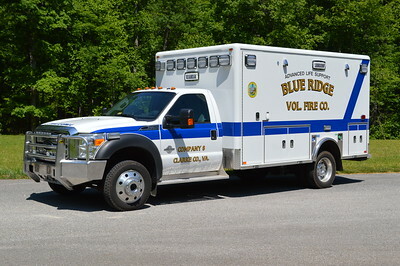 Two new deliveries for Blue Ridge during the first half of 2017. 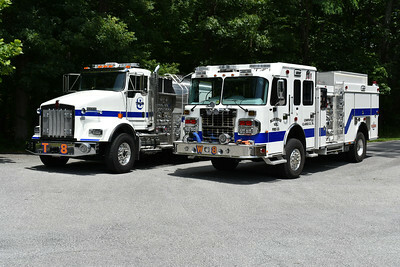 On the left is Tanker 8, a 2016 Kenworth T800 with a 2017 tanker body built by US Tanker. Wagon 8 on the right is a 2016 Spartan 4x4 with a 2017 Smeal body. Photographed in June of 2017 at Station 8. 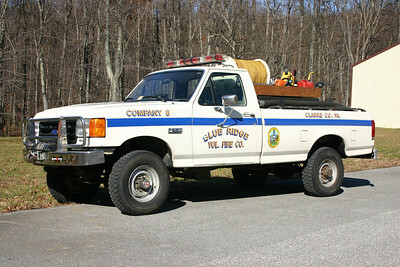 Brush 8 is a 1987 Ford F-350/CET, 250/300. Ambulance 8 is this sharp 2014 Ford-F450/Horton. ALS 8 is a 2011 Chevy Suburban equipped by FastLane. 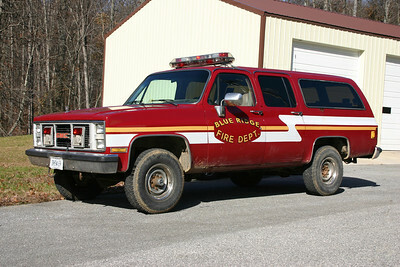 Utility 8 is a 1986 Suburban that was bought from the Franconia VFD in Fairfax County, Virginia. 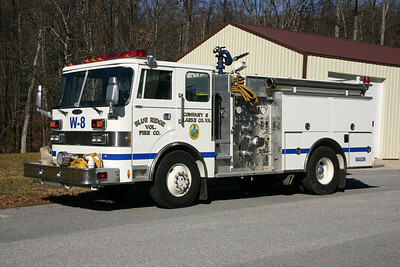 Former Wagon 8 was a unique 1990 Pierce Dash 4x4, 1250/750, sn- E5696. 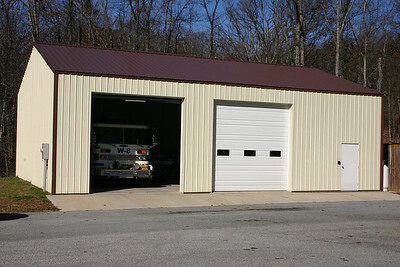 Sold in April of 2017 to the Boles Fire District in Labadie, Missouri. Officer side of the former Wagon 8. 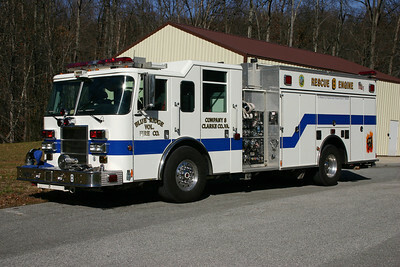 Sold to Boles Fire District in Labadie, Missouri. 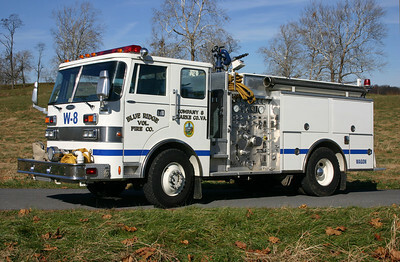 Another view of Blue Ridge's former 4x4 Pierce. 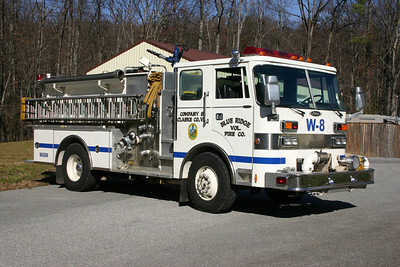 Former Wagon 8, a 1984 KenWorth/FMC, 1250/1000, sn- 4348. 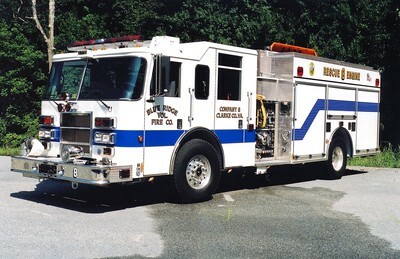 Former Rescue Engine 8, a 2002 Pierce Dash, 1250/750, sn- 13455. 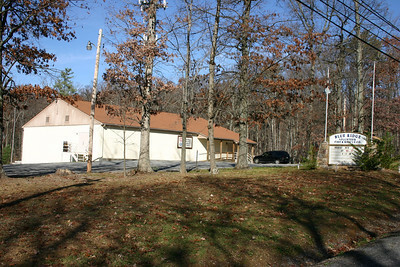 Sold to Stephens City, Virginia (Frederick County), in 2005. Stephens City Wagon 11 is a 2002 Pierce Dash equipped with a 1250/750. 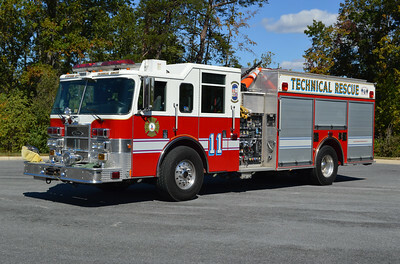 In addition to engine company duties it is a part of the departments Technical Rescue fleet. 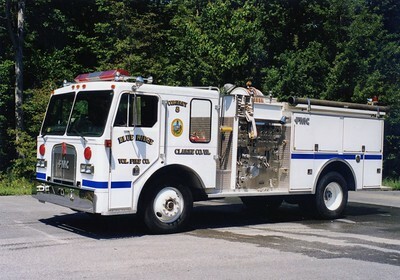 This Pierce was originally delivered to the Blue Ridge VFD in Clarke County Virginia. 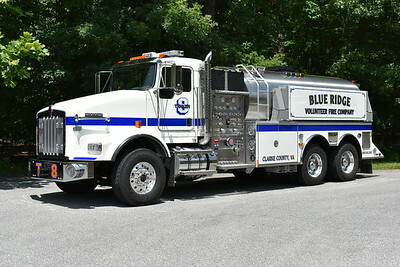 Blue Ridge's Tanker 8 is a 1996 International/S&S, 750/2500, sn-2335. It was replaced in June of 2017 and sold to a farmer in Greene County, Virginia. 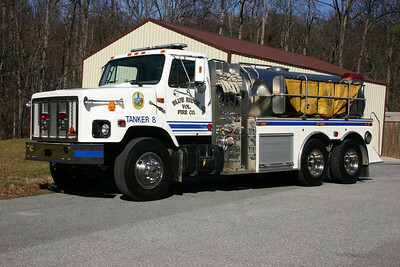 Former Tanker 8, a 1965 Ford 850/Howe, 250/1500, sn- 11794. ex - Middleburg, Virginia (Loudoun County). Sold to Fentress County, Tennessee. 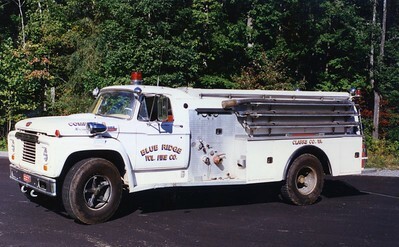 Linden's former 1966 GMC 4000/Oren, 750/500, sn- 2202. ex - Blue Ridge, Virginia (Clarke County). The back-up ambulance is a 1999 Ford F-350/PL Custom. This ambulance also operates as a boat support unit and has a tow hook in the rear. Sold in 2016. 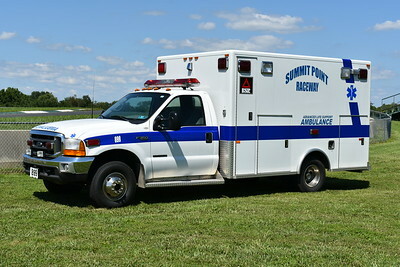 "899" from Summit Point is a 1999 Ford F350 built by PL Custom and purchased from the Blue Ridge Volunteer Fire Department in Clarke County, Virginia. 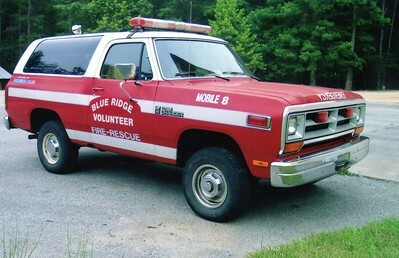 Former Mobile 8, a Dodge Ram Charger. ex - Round Hill, Virginia (Frederick County).